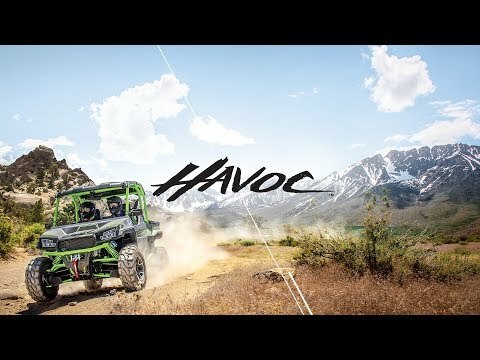 CLASS-LEADING 12.8 INCH FRONT SUSPENSION TRAVEL: Havoc X hits the ground running and puts the competition in the dust. 2.5 INCH KING PIGGYBACK RESERVOIR SHOCKS: We equipped it with 2.5 in. King Shocks that can take a beating, so you don’t have to. 67 FT. LB. OF TORQUE: Havoc X gets out of the gate with huge acceleration. CUSTOMIZABLE EXTENDED CAB: Havoc X includes 24 cu. ft. of storage and the most versatile cab in the industry. CLASS-LEADING 2,000 LB. 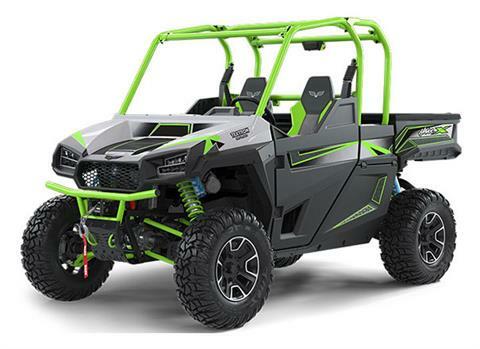 TOWING CAPACITY: If you’ve got a job to tackle, Havoc X is ready for the long haul. DRIVER EXPERIENCE: Aggressive fascia, grille and fender flares; class-leading 5.25 x 3.25 in. LCD display; 10 sq. ft. opening for easy entry/exit; comfortable color-keyed two-toned bucket seats; standard hi/lo LED headlights & accent lights; standard impact-resistant full doors; standard brush guard and 4,000 lb. WARN winch.